if interested send a pm with pp id, location, and items required. i will reply with an invoice. s&h is per order so best to get everything you might need at the same time. i wasnt sure what forum to put this in. since every autopilot needs gps this looks like a good place to start. some time back, as part of the day job, i designed and built a few hundred very small lightweight gps modules. to be safe i purchased more engines than needed to account for some doa. surprisingly only two failed final test and both of them were repairable, so im left with couple dozen extras which i would like to sell here or ebay. cost would be a fraction what places like sparkfun etc charge for similar units. and as can be seen in the attachments they weigh about 1/16th of more common modules and are much smaller size. complete, ready to plug in. baud etc is jumper selectable. perfect for 1s multicopter or micro plane. built in vreg so no additional components needed and no special configuration software required because of the jumpers. if theres interest i can put up more details. let me know. ive added photos of some available usb/serial converters that plug directly into the gps-e modules. not required but might make testing easier. saves having to worry about wiring up cables or power supplies or whatever. running windows hyperterm or any other serial program will show messages scrolling by even if youre indoors and theres no lock. or driving around with map software like delorme atlas, ms street, or google earth. these programs are far more powerful and flexible than most car navigation units. also may come in handy if you want to run the ublox configuration software although as mentioned i havent had the need yet. my multiwii quadcopter for example uses the default nmea protocol @9600 baud. even programs that run a different protocol or baud usually start out with the defaults and reconfigure every time on power up as required. getting started hints added at post #26. also above pinout changed to reflect actual pcb numbering instead of 1-5. gnd (pin 24) is the one closest to the corner of the module. ill put up a better diagram or photo when theres time but this should be enough for now. those with the usb/serial converter have a very easy way to test units. with module attached simply plug into any usb port and the blue rx light on the converter will start flashing immediately to show messages being sent. this happens even if indoors and there is no lock. its not necessary to have any special drivers or software running or even plugged into a pc. ie the usb jack of an ipod charger works. flashes occur at 1hz which is default. using that method outside you can actually see the led stay on longer with each flash as the sats start to fill in. running a comm program like windows hyperterm allows seeing the content of the transmissions. note that this is a prolific/ftdi type (pl2303) and drivers may be required depending on your computer and operating system. default baud=9600 handshake=none. right after connection some brief version messages are sent ($GPTXT) followed by nmea data. at first this contains mostly commas. if youre outside in the open and sky is clear then position and satellite info starts to fill in. after a minute or two lock should be established. it can take longer depending on your latitude or if cloudy or not in the open. progress can be followed by noting number of satellites in the GGA message. at least 2 are needed for 2d lock and 3 or more for 3d. running map programs like delorme atlas, ms streets, or google earth is another way to check these out. at least one fellow bought one to use for car navigation because these programs are much more powerful and flexible than the dashboard units. you can also use the gps demo program from ublox site which displays settings, location, and satellites. if you have a multicopter fc or autopilot board but no usb/serial adapter the easiest way to test is probably just plug in and use the fc status led or config/gui program if availalble. double check pinout and make sure voltage is 3.3-4.2v before connecting. 4.2v is the maximum allowed voltage and any more (ie 5v) requires additional regulation. fortunately most control boards use 3.3v. check the user docs but best to also verify with a meter. its possible to test the unit without a fc or usb converter by connecting an led from tx (pin 20) to vcc (pin 23) on the 1mm connector. a 1k series resistor will limit current. in addition to the handling warnings for the 1mm female connector mentioned previously be careful soldering wires. keep solder away from the body of the connector to avoid wicking into the socket. it happens quickly and is hard to clear out. and remember THIN wire (32awg stranded) is the key. a bit of heatshrink when youre done helps too. for real stand alone testing theres a "pulse" signal available on pad #3 of the engine pcb. an led here will start blinking when 4 or more satellites are aquired. there are also baud/protocol configuration pads on the pcb but imo its better to configure fc software to expect default settings, at least on startup. 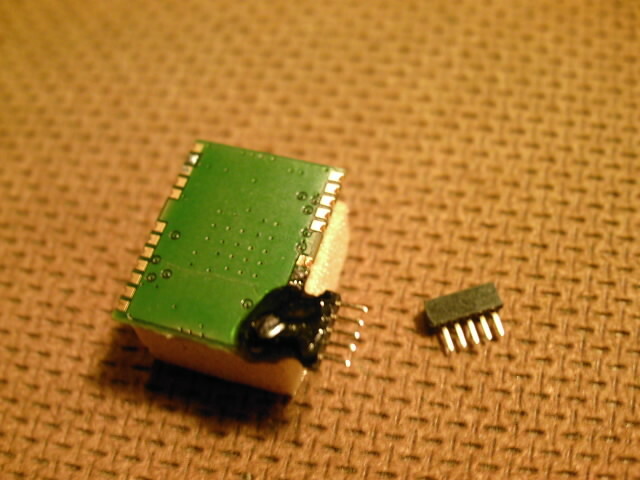 soldering to tiny engine pcb pads is tricky and isnt recommended if it can be avoided. due to issues with inadequate voltage from some serial/usb converters on some pcs ive boosted the gps module minimum input spec a few mv to 3.4v. this is much closer to the range of a lipo cell which was original design goal. to power off a 5v bec all thats needed is to insert a common silicon diode between the 5v and the module which will drop that down to around 4.2v. a tenth of a volt one way or the other dont really matter but in any case its always a good idea to check supply voltage with a meter before connecting. gps module interface has been redesigned to accept a slightly wider range of voltages. this was not a problem for most people but there were a few cases where some systems had trouble with the usb dongles. a couple had trouble with 3.3v supplies that were not quite 3.3v or had noise issues. minimum volt level is now 3.0v and a higher capacity filter which should help with that. spec above has been updated. usb/serial converter is replaced with a new type that helps to minimize hardware and software compatibility issues experienced with some pcs and operating systems. uses a real ftdi chip instead of clone. one drawback is the rx monitor led was not built-in so i have to add one. these cost me a little more but sale price is the same. i think for most of the guys who bought these previously the 1mm to .1" adapter was more important than the usb converter part. note that a pin has been removed on that like before to prevent plugging in wrong. for those who dont like fine soldering im making available a prewired 5 pin connector for couple bucks. its considerably more rugged than the header type shipped with the gps modules. firmer connection too but does weigh a bit more. photo of baud rate configuration jumpers added. generally all thats needed is a dot of solder to make the connection. not everybody is lucky to have a good view of satellites with quick lock so here are some solutions for backing up the satellite almanac. warm start lock times are in the 5-10 second range instead of minutes even if you are way north. today i tested two capacitor variations: very low cost 470uf aluminum electrolytic and .47 farad supercap. the first gives a few minutes backup, more than enough to change battery, and the second up to a day or so. next on the agenda some lithium cell solutions which should get us weeks, months, or years. ive included a photo of the circuit commonly used to keep these caps and batteries charged. after experimenting with capacitors i hooked up an lir2032 type rechargeable lithium coin cell. checking data retention every day or two it finally gave out after 15 days. quite an improvement over the caps. according to estimates some non-rechargeable versions would last even longer. there is a drawback though, weighs more than the gps module itself. specially with that clunky holder. a full size holder would have been even worse. still its the best solution so far for long term backup. and CHEAP! another backup option evaluated: ms621fe mini rechargeable lithium battery (photo attached). these are built-into the better full size gps modules. costs a lot more than the bigger lir2032. worth it if you are after absolutely smallest lightest solution. smaller than the caps or any other energy storage device afaik. after about 10 days charge time it provided over two days backup which aint too shabby. so if you fly on a daily basis the lock time will be very short every time. as mentioned these batteries are not cheap so you pay for the privilege. little more than a gram! we could put a dozen gps-e modules in place of the current type and still beat it. not to mention the size difference. around half inch square! bottom closeup. flat area for foam tape or velcro mounting. top closeup. free 1mm female connector included. heres one with 1n4007 diode to drop 5v down to 4.2v. notice by lifting tabs pins can be rearranged to suit whatever pinout. multiwii mega fc w/10dof & flysky rx. 9gram WITH gps-e. since this photo i cut size and cost even more. also made it more mechanically stable. baud rate configuration jumpers. photo shows pins 14-15 shorted for 38kbaud. 470uf electrolytic gives a few minutes backup so you can change battery w/o losing lock. "supercap" types can hold data for many hours or days. circuit to keep the backup battery charged. lithium coin cell keeps data for over 2 weeks! ms621fe mini rechargeable lithium backup. Could You be SO kind and post more tech specifications (interfaces, protocols, sesitivity, no of channels, etc)? Hi Dave, I'd like one of these. hey, zr! fancy meeting you here. you really get around. seems, like me, you tend to wander the forums. i dont understand those guys who stay stuck in one place. looks like this may become popular. 2 pm sales overnight. at least for these overstock units cost is $26 free shipping (per order, conus). its about half what sparkfun wants for their micro-gps module. anyone interested should pm pp address and ill send an invoice. ive added specs and more photos to post #1.
any more questions dont hesitate to ask. Will this work on a DragonOSD+ v2? Hah, I was stalking you to see if you had mentioned the tiny props and saw this post. PM sent. yikes! 7 orders overnight. maybe i shoulda priced them a lot higher. lol. actually this is not so much for profit as liquidating overstock so for now ill stick with the $26 shipped usa. maybe when these are gone ill consider producing more. cost might be a little higher then but still nothing like what places like sparkfun and the fpv dealers charge. these will be shipped on first come first served basis so probably a good idea to alert me in this thread if youre interested. specially if the pm overflows again to at least get in the que. anyway still have 13 left atm so no panic. yes, should be no problem. perfect way to enable autopilot/return-to-home features on that very small and light osd. i dont own one myself ($130 too rich for my blood!) but i know a couple guys who do. ublox is highly recommended by dragon because of the 5hz rate unlike sirf which they actively discourage. my units just connect direct thanks to the 3.3v on their gps plug. Last edited by dave1993; Oct 09, 2013 at 01:54 PM. Reason: 5 not 10! I'm in... Just PM'd you for one. I'm from São Paulo, Brazil, and intersted in these small GPS units. It could be work with APM2 and APM2.5 autopilots? How much for shipping it to here, Brazil? USPS are ok, if trackable. hi eco. i think overseas shipping, if similar to when i sent out those turnigy memory expanders last year, about $5-$6. not sure about tracking but probably a lot more, around $20. let me know what you want and ill put that in the pp payment request. you can take a look and if necessary we can adjust before you accept. as mentioned usa shipping is free. im pretty sure apm is compatible with ublox. these modules definitely work with projects like multiwii, pirate, etc. afaik these fc boards expect default baud on startup or do autobaud like dragon then modify to their choosing. i do know these work pretty much the same as full size modules. only difference is the extra stuff like leds, 24c32, antenna cables&connectors, supercaps, batteries, etc have been stripped. but like i said those are pretty much dead weight for modern gps imo. pins are available for users to add that stuff but try it w/o first. thats what i did. biggest weight saving was replacing heavy ceramic antenna with foam. dielectric dimensions were modified accounting for the difference in velocity factor. the bigger patches do have slightly better aperture/polar-pattern but gain is similar. i was suprised how well the smaller ones hold up. aquisition in the open usually takes only a minute or two with clear sky. even up here in the northeast. ok, i got all the usa invoices out. one thing, since this is zero margin transaction i need to receive full amount. send $26 if paying as personal via bank account or paypal account. otherwise they charge 9% cc surcharge fee which i pass on. its listed as s&h but ignore it if you can get $26 here. international invoices will be sent out tomorrow because i need to check shipping charges. thanks again for helping me clear these out (turns out theres no big advantage to hooking up 24 gps to my quadcopter. lol). also in case anybody missed the post #1 updates there are some usb/serial converters available designed to interface directly with the modules. i only got these three. $14, again free s&h conus. not really required but could make it easier for some 1st time users. or the 1mm/.1" adapter might come in handy for those who dont like to solder tiny cables. Last edited by eosglider; Oct 10, 2013 at 10:38 AM. Hi, do you still have one module left to sell me? glad to see you finally decided to jump in and start posting. i got 5 left. one fellow ordered 4 this morning (did i mention several gps per model does NOT improve accuracy or lock time? lol). pm your paypal address and ill send an invoice.